This event was sponsored by My Ancestors Found’s very own Holly Hansen and Jenni Johnson. Holly was the Jamboree Chair, coordinating all aspects of the event during the past year. Jenni did massive amounts of work behind the scenes including the website, marketing collateral, the program, the 300+ page syllabus and so much more. 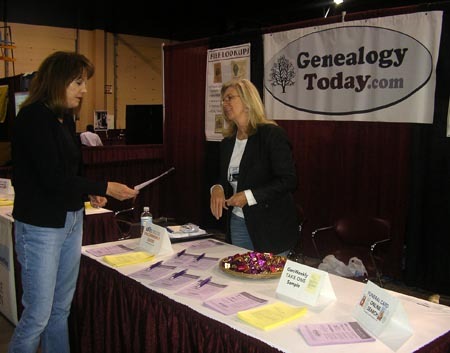 Our own Betty Lindsay (editor of GenWeekly) handled the Genealogy Today booth, sharing the exciting developments on our site and all of the unique information we have available. The funeral cards drew a LOT of interest. People were really intrigued. It set them to thinking about what kinds of things could be used as resource material, and it provided a great lead-in to talking about the other “unique” sources we have in the Family Tree Connection. This show has really seen some great growth with over 1,000 people attending (although the Dixie Center estimated traffic at well over 2,000), and has become a great event to kick off the year’s conference schedule. If you’re not familiar with St. George, it’s in the southern part of Utah, and just a short drive from Las Vegas.